What, exactly, is a muscle car? Mustang, Camaro, Corvette, and Charger fans will tell you it's simple: "A big V8. No, make that a huge V8." Well, they're wrong, and the Buick Grand National with it's 231ci V6 that just blew their doors off begs to differ. Sure, a muscle car CAN have a V8. But that's just one means to an end. The true definition of a muscle car goes like this: "Shove the biggest, baddest motor you can into the smallest car you make." Hell, that's what Pontiac did to make the GTO: they took a mid-sized Tempest and stuffed it with a 389ci V8 with a whole ton of carbs. It's the whole car to engine size ratio. 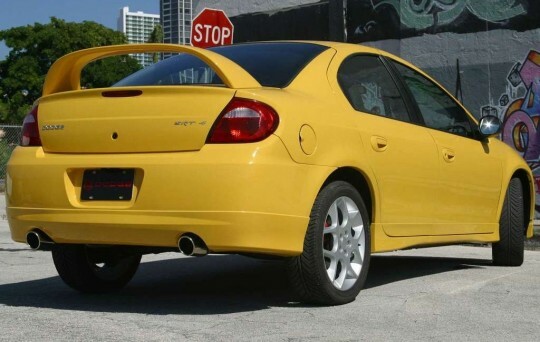 So I respectfully offer the Dodge SRT-4 as the perfect example of a modern musclecar, and that's why it will soon be considered a classic: it's one of a dying breed. As huge engines in small cars are replaced by tiny engines paired with electric motors and kinetic energy recovery systems, the traditional hot-rod muscle car is dying, and you should probably enjoy one while it's still legal. So how the hell is a Dodge Neon a muscle car? Well, it follows the formula to a T. They stuffed the most powerful engine possible into their smallest car, and the end result was a few things: 1) Cheap. 2) Fast as hell. 3) Slightly scary in a "did you run this by the lawyers?!?" sort of way. There were a few things it was not. 1) Efficient. 2) Refined. 3) Eco Friendly. The basic Dodge Neon, let's go ahead and admit, was transportation to the lowest common denominator. It was a car. It had doors, a roof, an engine, some tires, a steering wheel, and it'd get you where you were going unless the head gasket blew. Which it usually did. There aren't many nice things to say about Neons, because there aren't many nice things in a Neon. It came with a 2.0L 16v four that choked out 150 horsepower with all the grace of a drunk cement mixer. More fun could be found in, say, a Hyundai Elantra GT. When Chrysler formed the PVO (Performance Vehicles Operation) in the early 2000's, their first target was the Neon. I don't know why, but as enthusiasts we should be thankful. They turned the Neon from a lame duck to an absurdly fast pocket rocket that could steal lunch money from Mustang GT's and 350Z's without breathing too hard. How? Powerful engine, small car. Out went the regular Neon's 2.0L motor, replaced by the 2.4L block shared with the PT Cruiser, Town & Country, and Stratus. Internal changes were limited to Inconel exhaust valves to deal with the heat from the huge turbocharger. Air pressurizing duties were assigned to a Mitsubishi TD04LR-16G turbocharger with integrated wastegate which delivered about 14psi peak to the motor through a fairly humongous Valeo 8-row aluminum front-mounted intercooler. With a 6250rpm rev limit, Chrysler quoted maximum power at 215bhp and 245lb-ft of torque. Which sounded pretty damn impressive, except it was a lie: Sport Compact Car dyno'd an early production model at 223 horsepower... at the wheels. Which rounds out to about 265 horsepower at the crank. While it's unclear why Chrysler underrated the true power output of this engine (insurance reasons? Testing under worst-case scenario, with the A/C on and the intercooler heat soaked? 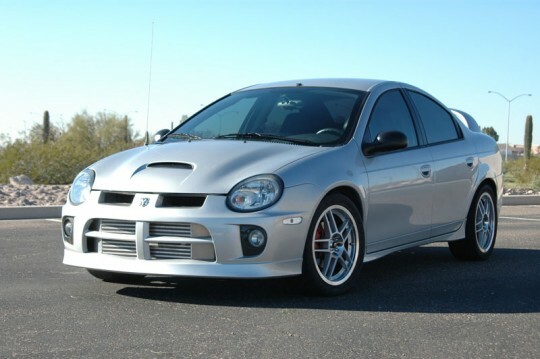 ), it made the SRT-4 the baddest sport compact anywhere. 0-60 took 5.3 seconds, the quarter mile was gone in 13.8 seconds @ 103mph, and the SRT-4 would do 153mph flat-out. This was when sport compacts were still making somewhere in the 170bhp range, and nothing could keep up. In fact, the $20,000 SRT-4 would show tail lights to the $27,000 Nissan 350Z all day long. 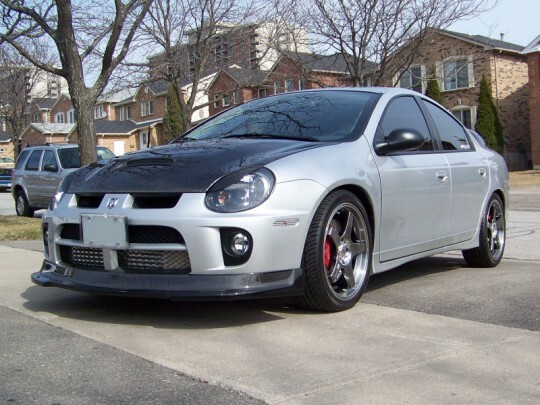 For the 2004 model year, Dodge fixed and upgraded a few things on the SRT-4. 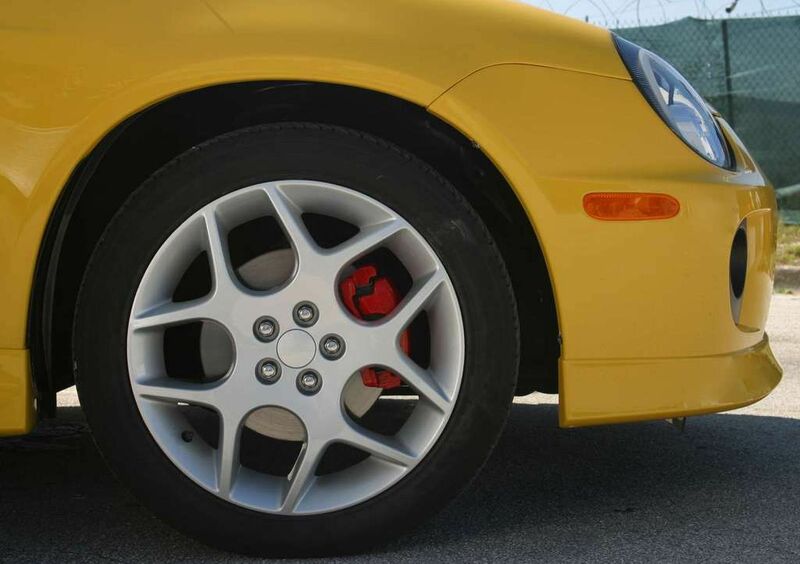 Most importantly, to solve the problem of the SRT-4 lighting up an inside tire every time the throttle was applied in anything other than a straight line, a Quaife torque-sensing mechanical limited slip differential was fitted. The engine received higher-rate fuel injectors and a remapped ECU, and power jumped to a more believable (but still underrated) 230 horsepower and 250 lb-ft of torque. Power was sent through a NVG T-850 5-speed manual and a heavy-duty Sachs clutch to the front tires. The SRT-4 got stiffer springs, shocks, and thicker swaybars. The brakes were bigger all around, ventilated in front, to keep things under control. 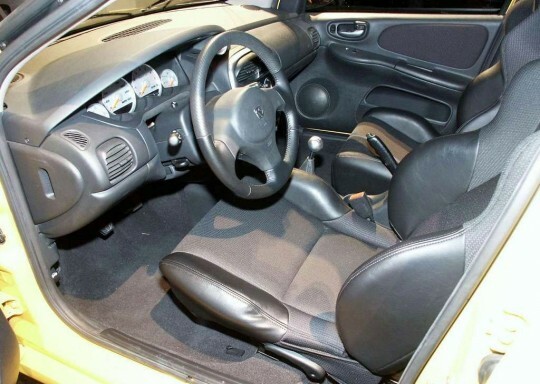 Inside, the SRT-4 got the bare minimum: thickly bolstered sport seats, an integrated boost gauge, a chunky contoured steering wheel, and... actually, that was it. It's an impressive list of changes, but what's cooler is what Dodge didn't do than what they did. 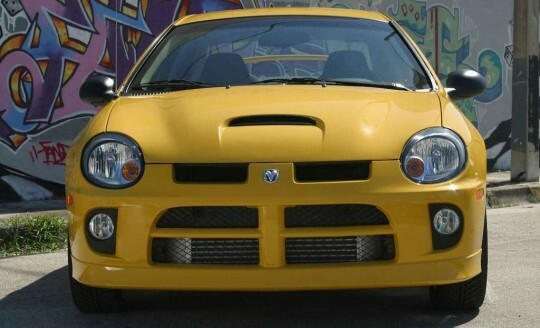 While companies like Mazda were busy filling the Protege's trunk with subwoofers, amps, and sticking in a goofy head unit while they half-assed (actually, outsourced) a turbo setup, Dodge spent all the development money making the SRT-4 go really damn fast. There were power windows in the front... and crank-up windows in the back. There weren't even mufflers, for god's sake: just the turbo and some resonators made the SRT-4 road legal. It burbled at idle, spit and popped under engine braking, and howled like a Group A race car from the late 80's under wide-open throttle. The front end looked like it'd been attacked with the cooling axe. It wasn't pretty, but who cared? "Hi!" became "Get out of my way or I'll eat you." Overnight, the Neon found some cajones. Hi! NOW MOVE OUT OF MY WAY, MUSTANG! What was it like to drive? Single word answer: epic. It was a raw handful, it bordered on hilarious and illegal at the same time. It chugged and groaned at low rpm, the loud exhaust letting everyone know you didn't buy the secretary's special. When boost hit, the steering wheel would jerk in your hands, trying to steer into the parked cars on the side of the road. It was angry - the thrust from that big MHI turbo was really more than the 215-width front tires could deal with in the dry. In the wet? Wheelspin clear through second gear, sometimes third, from a roll. Don't even bother. The suspension was unyieldingly stiff, but the SRT-4 was alive with steering feel and it actually handled pretty damn well. The brakes were up to the task, which was reassuring. Only the things you touched in the interior were worth mentioning: everything else was impossibly low-rent. Dash-strokers need not apply - your $30,000 A4 can't keep up anyway, man. It was the American muscle car at it's most raw and elemental. Sure, it had a tiny gas tank, got about 14mpg around town, and lacked cruise control. It wasn't exactly intended as a road-trip machine or a highway luxobarge in the first place. And if 230 horsepower and high thirteen second quarter miles for under 20k (the 2003 SRT-4 had a base MSRP of $19,995) wasn't enough, you could get "staged" power upgrades through Mopar. Which were covered under your powertrain warranty, and could be rolled up into your payments. Stage 1 included the bigger 2004+ injectors and a recalibrated PCM for 240 horsepower. Stage 2 included even larger injectors, new MAP and TIP sensors, and a stiffer preload on the wastegate, for 260 horsepower - or 280 when set for 100 octane race gas. 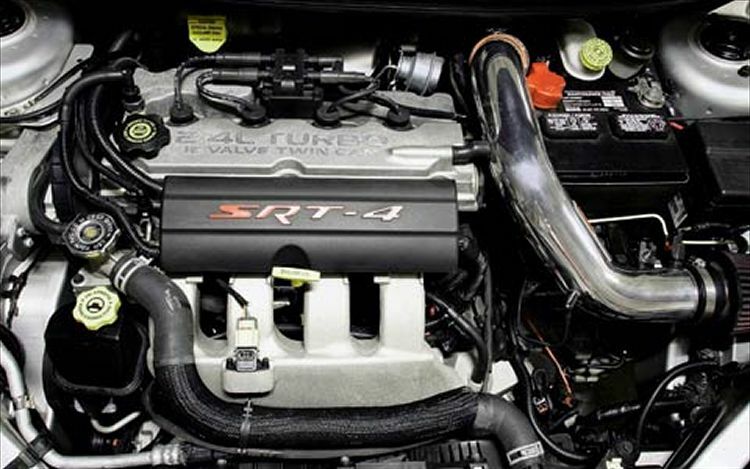 Stage 3 threw in a larger TD05 turbocharger on top of all the other goodies, for more than 300 horsepower on pump gas. Of course, most SRT-4's remained stock about as long as it took for them to roll off the dealer lot they were issued from. If you see a Skittle (as they're affectionately referred to today, due to their shape and bright colors) today, chances are between slim and none that it hasn't had the boost cranked up and an obnoxious compressor bypass valve fitted. 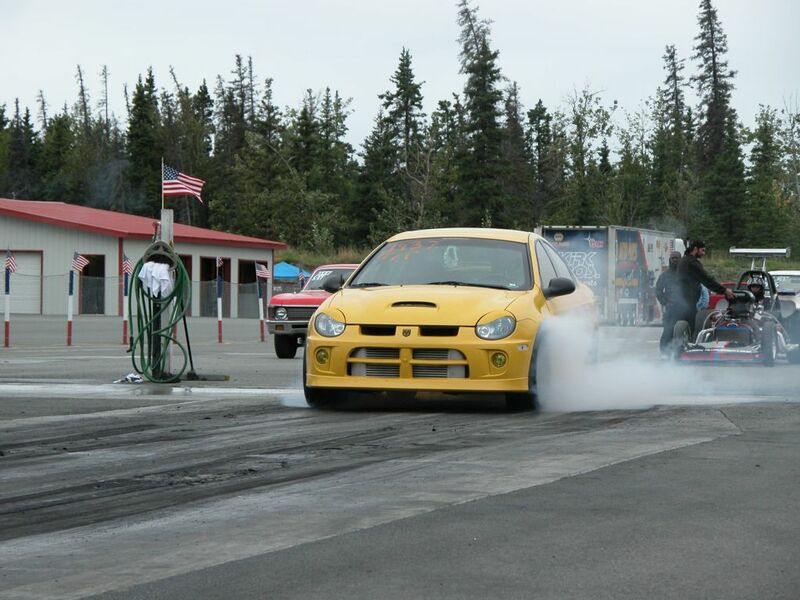 Currently, the fastest 1/4 mile time for an SRT-4 on dragtimes is a 10.745 at a tenth under 130 miles an hour. That particular car puts 580 horsepower to the wheels via a built motor with a T67 turbo. 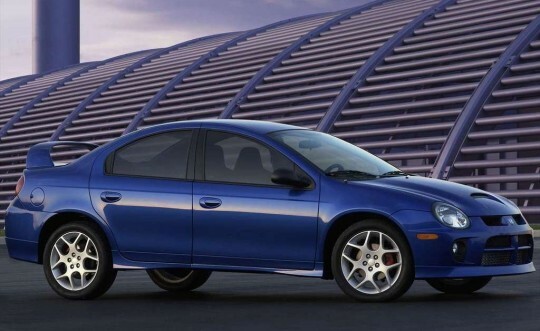 The SRT-4 ceased production along with the rest of the Neon line in 2005, replaced by the utterly mediocre Dodge Caliber. While there was a Caliber SRT-4 variant with even more power (285 horsepower to the crank! ), the club-racer-with-license-plates mentality was gone, replaced with pseudo-SUV proportions, giant wheels, and a Mitsubishi engine. It was more refined, quieter, rode better, and could actually cross county lines on one tank of gas, but it wasn't the same - and buyers knew it. By the end of the Caliber SRT-4's production run, they were selling for massive discounts just to get cleared off the lot. SRT-4's hold a lot more value than their regular Neon brethren, but when you consider they retailed for about $20k five years ago, they're still not worth much today. A search of AutoTrader with a 300 mile radius from my area revealed examples ranging from a high end of about $15k for modified, low-mileage examples to about $5k for total basket cases. They offer remarkable bang-for-the-buck today, but just think about in ten years - when everything is diesel-hybrid-extended-range-electric-ULEV with a CVT and ESP and you-know-me, raw turbocharged musclecars like the SRT-4 will be worth way more than sense would dictate. Just ask Buick Grand National owners about this. Now might be the time to grab one, while you're stilled allowed to.